A small, fast, easy and guilt free 'pizza'. Warm sauce in a microwave-safe mini cup until it's warm. Spread sauce over rice cake. Break string cheese into pieces as small as you like, the smaller the better. Spread cheese over rice cake. Microwave until cheese melts 10-20 seconds. 94 members have added this recipe to their cookbook. Yummy low carb egg muffins. 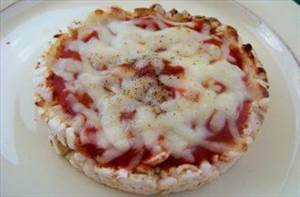 There are 106 calories in 1 serving of Rice Cake Pizza. Calorie Breakdown: 5% fat, 43% carbs, 52% prot.